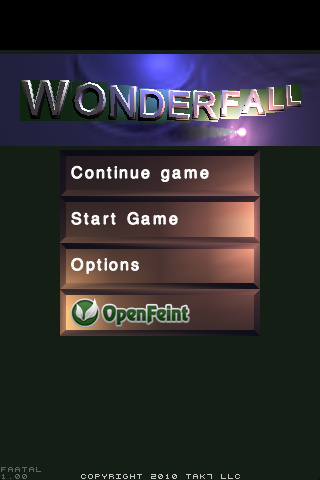 Wonderfall is an action word game for the iPhone, iPod Touch and iPad. Letters fall. Join letters into words. Chain together multiple words for massive scores! Addictive fun? Indeed! Wonderfall will exercise your brain and keep you coming back for more. As letters enter the screen, touch each letter to form words. For example, you could touch F, U, N to make FUN. 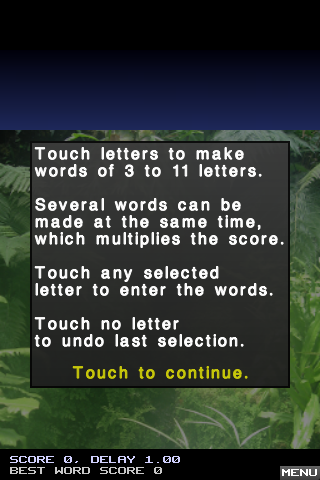 You could then touch any of the selected letters F, U, or N to enter the word, removing it from the screen and scoring some points, but you would double your points if you touched more letters to add another word, like C, A, R. Now you would have FUN, CAR selected and will get double their combined score. A third word would triple their combined score and so on. 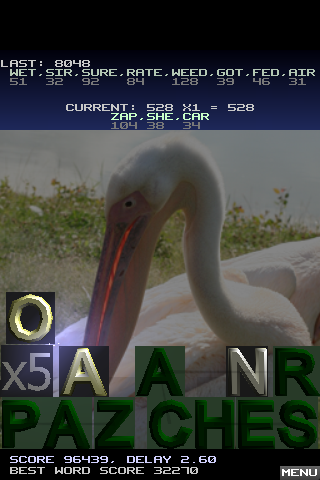 The rarer a letter is, the more points it is worth. 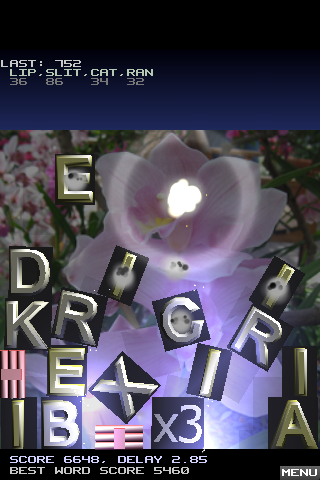 The speed that letters are created increases as words are entered. 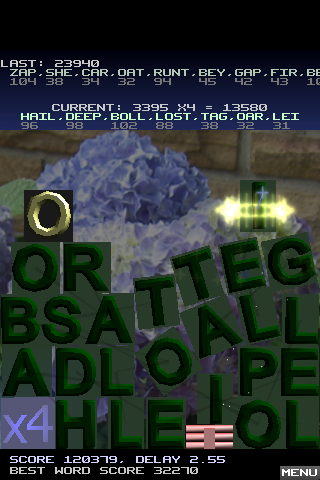 You can drag the letters around the screen to make room for new letters. 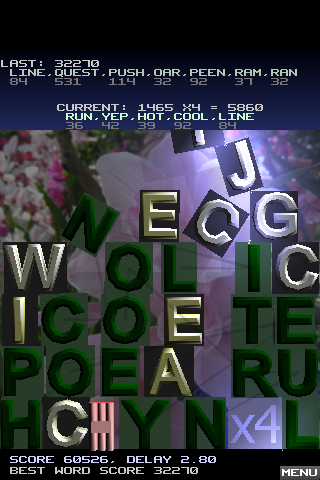 Wonderfall uses a physics engine, so letters bounce and spin as they collide with other letters and the walls. The game ends when a letter hits another letter above the play area, so make room for new letters by moving them or using them. 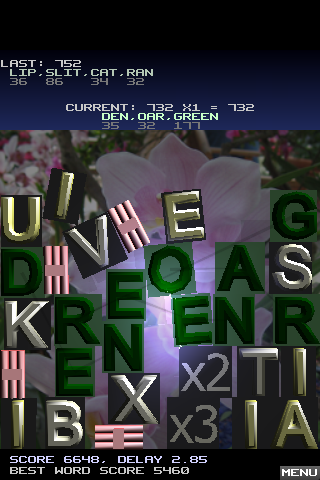 To remove the last selected letter or multiplier, touch a blank area of the screen. Wonderfall is OpenFeint enabled, so you can compare your best game score and word score with other players. 13 achievements can also be unlocked. 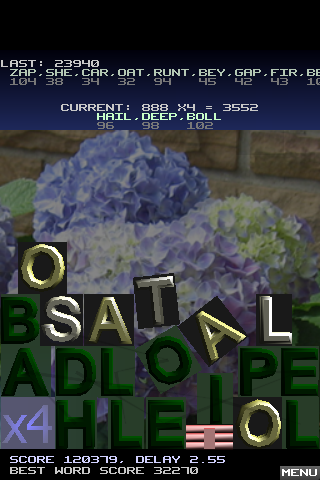 Occasionally a bomb will fall instead of a letter. Once you touch the bomb, it will be armed and will detonate on release, so drag it where you want it before you let go. It will destroy letters, multipliers and detonate other bombs near it. Use them to make space in a crunch or remove excess letters. 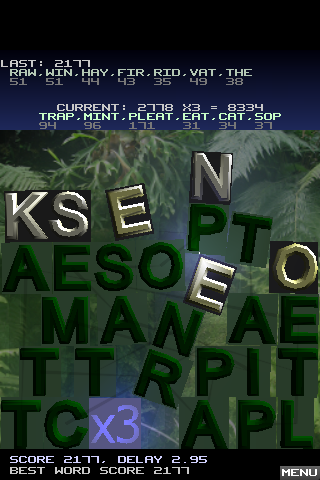 These x2, x3, x4 and x5 "letters" drop randomly after words are entered. 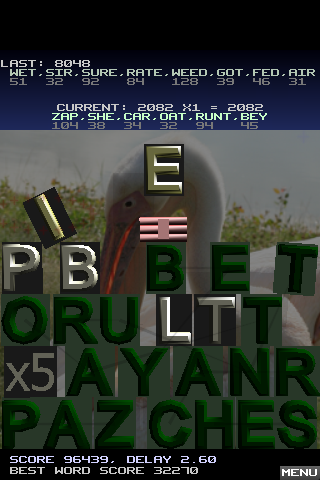 The more words entered at a time, the increased chance of a higher multiplier. Touch the multiplier to turn it blue, which activates it. All multipliers can be active at the same time and are cumulative, so a x3 and x5 would give you x15! 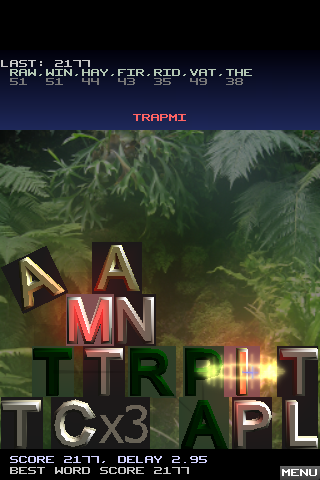 The next word or words entered will have their score multiplied by the active multipliers and those multipliers will disappear. 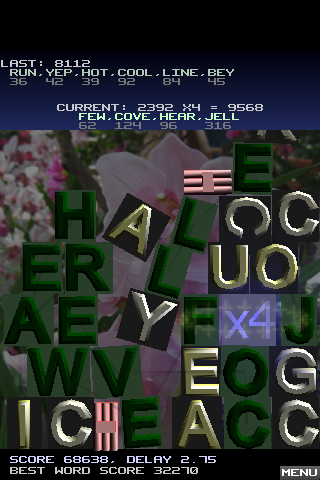 You can tilt the left or right edge of the screen down to make letters shift in that direction. This can be disabled in the Options menu.